Hello everyone - well December is here so Christmas is nearly upon us!!! I am swamped with orders and have another craft show to do next week so am very nearly hairless LOL. Thank you both so much for agreeing to be on the team even though I am the most disorganised person on the planet! 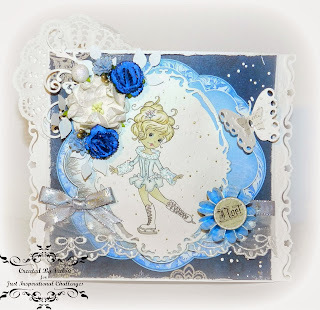 I really look forward to seeing all your fab projects along with Paper daisies and Valou. I know that some of you will have finished all your Christmas cards ages ago so I have added the theme winter to the challenge so anything using Wintry colours or a wintry theme is welcome. Someone did ask if painted silk can be entered and the answer is yes, as long as you have made your project it can be anything from a card, a scrapbook page, a piece of altered art or mixed media or indeed painted silk - if you've made it and it fits the monthly theme, I want to see it! Wow thanks a lot for choosing my card to the Top 3. How can i get this button for my sidebar? Beautiful DT creations and thanks for a great challenge. Thanks a lot for choosing my card as one of the Top 3. Congrats to all the other winners too. God bless! Thanks for all the fabulous creations by the DT and for your wonderful challenges. I would love for you to join me for a chance to win FREE candy on my blog. I need 10 more followers to reach my goal of 500 followers.